On The Pierate Ship we are always on the look out for pies that seem like they might be bit special. Often you can have a fair idea which pies might stand out from the com-pie-tition before even trying them. Perhaps they may have won numerous awards. Sometime you can tell just from the pictures. Mr C's Pies from Newburgh, Fife have certainly ticked both these boxes. 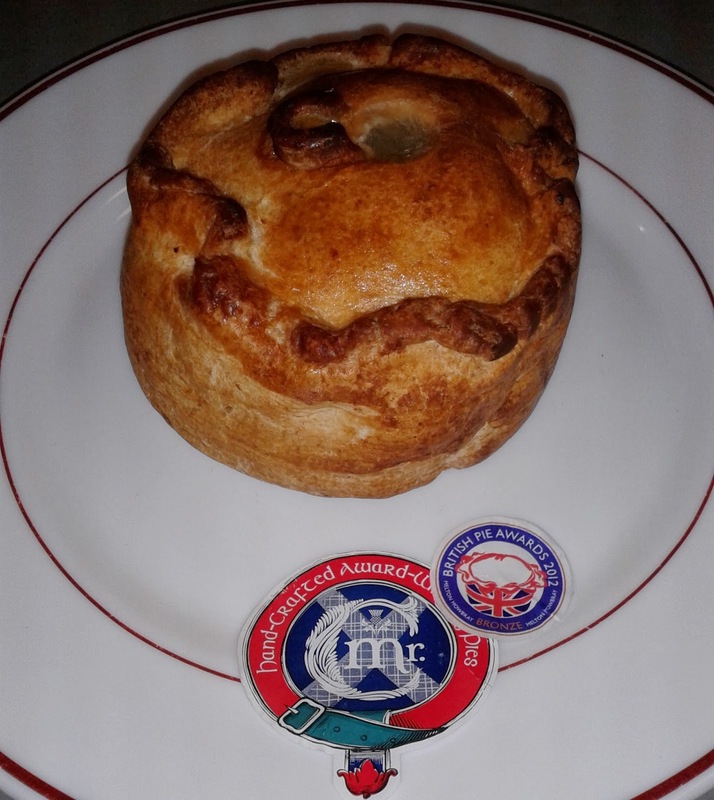 They have won numerous British Pie Awards and Scotch Pie Club Awards. You can see from the picture below that they look outstanding. 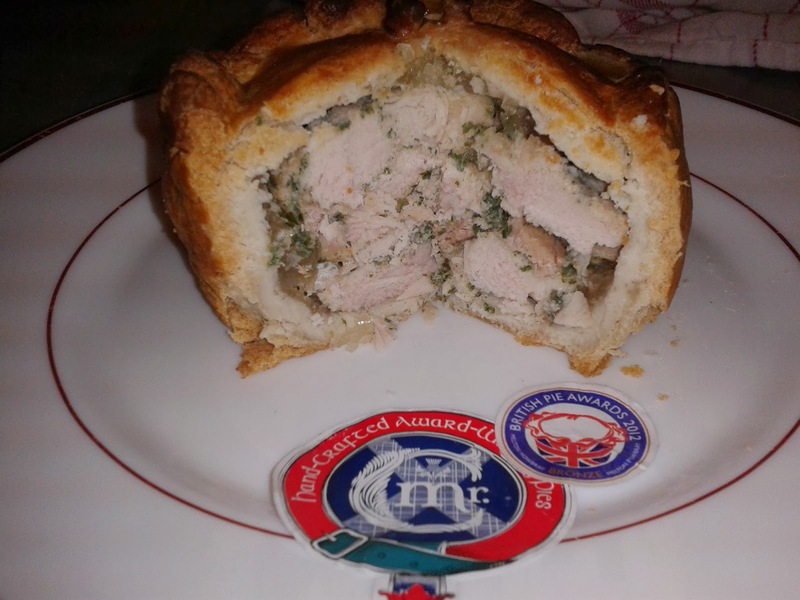 This is the Chicken & Ham, itself a winner at the British Pie Awards 2012. Just look at the perfect brown Colour and the lovingly handmade Condition, this pie really does look promising. I was very pleased to find some Mr C's Pies when I went to Crombies of Edinburgh to review their Scotch Pie. In fact, to say I was pleased was an understatement, for a Pierateer this was very exciting. I grabbed the Chicken & Ham and rushed back home to try some. It looked resplendent on the plate, this was a pie with presence. It helped that it was a big pie, but there was more too it than that. It was eye catching and different. 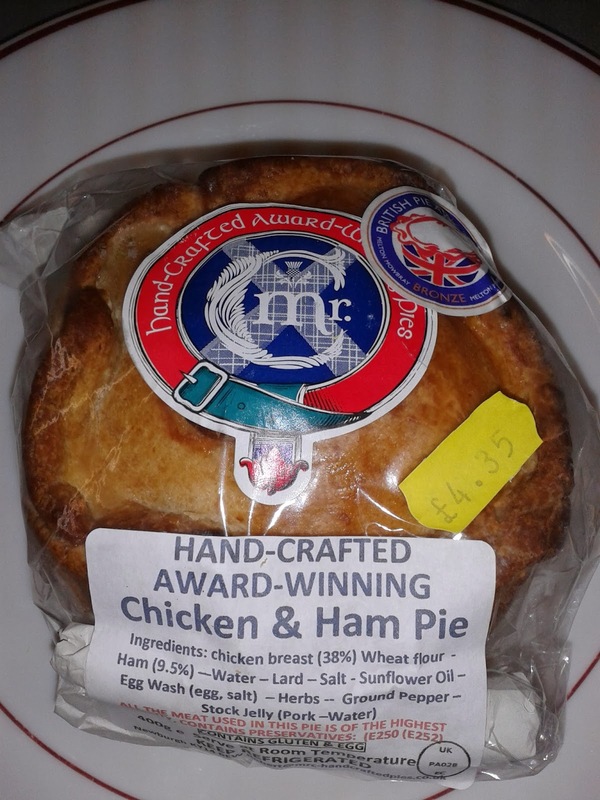 It was made with the same kind of hot water crust pastry that you get with a Melton Mowbray Pork Pie but adapted through the experimentation of Mr C. This gives a wonderful rigidity to the pastry and because it is a pie that can be eaten cold it would be perfect for eating on the move. I can just imagine these as great picnic pies. Delving into the Content of this pie it was impossible to be disappointed. They are absolutely packed with meat. For a 400g pie I felt I was getting good value at £4.35. There were plenty of herbs and seasoning, so much so that it tasted a bit like roast chicken with stuffing. The chicken was certainly dominant, I would say the Ham was a bit lacking which I think you can tell from the picture. I would have liked to have seen more Ham to give variation to the flavour. The meat was good quality and not at all Chewy. Despite this being a cold pie without sauce it wasn't dry in any way. The pastry was soft and melt in the mouth and combined well with the filling to give a wonderful texture. The pastry also tasted great, it was well cooked so it was a pleasure to eat, even by itself. The main criticism I had with this pie was that it was a little too salty which I started to notice after a while (but perhaps this was because I was eating a lot of it). But this wouldn't put me off buying this pie again, it is a fantastic example of a hot water crust pastry pie. There aren't enough hot water crust pastry pies which provide something different to the standard pork flavour. After eating this Mr C's pie I am not quite sure why. It deserves the status of 'Pierate Recommended' pie to add to the other awards won by Mr C.